OurEnergyPolicy.org | Can Natural Gas and Renewables Be Synergistic, Not Competitive? Can Natural Gas and Renewables Be Synergistic, Not Competitive? Faced with a capacity shortage as a result of the retirement of the 2,200 MW San Onofre Nuclear Generation Station (SONGS), the California Public Utilities Commission issued a procurement decision which included a provision for new natural-gas fired power plants. The decision was criticized by environmental and renewable industry organizations who advocated for including only carbon-free energy sources. Plans to construct a natural gas power plant to replace the Salem Harbor coal power station was challenged in court by environmental groups who argued the plant would prevent the state of Massachusetts from meeting emissions targets in its Global Warming Solutions Act. The lawsuit resulted in a settlement that stipulates the new gas-fired plant must reduce its carbon emissions by 2026. But are we overlooking opportunities for synergistic benefits of natural gas with renewables? That was the focus of a February 2014 report by the Joint Institute for Strategic Energy Analysis which explored the potential business cases for complementary natural gas and renewable energy. Flexible natural gas-fired power plants can help integrate higher percentages of wind and solar because they provide dispatchable capacity that can rapidly adjust output to balance electric system loads. Hybrid energy systems where natural gas capacity is co-located alongside wind or solar sources could allow power producers to guarantee firm, reliable electricity delivery. Are natural gas and renewables necessarily competitive, or should they be viewed as complementary? How can energy policy and electricity markets capitalize on potential synergistic benefits? What effect could this approach have on the development of a low carbon energy system? Are natural gas and renewables necessarily competitive, or should they be viewed as complementary? How can energy policy and electricity markets capitalize on potential synergistic benefits? 59 Responses to Can Natural Gas and Renewables Be Synergistic, Not Competitive? So the point was that methane leakage is a problem that should and can be solved. It’s also important to keep in mind that coal production and use pose a number of serious environmental and health impacts — besides GHG emissions — that natural gas avoids. The overall benefits still greatly favor natural gas. Your concluding comment is correct and answers your first question. Advanced natural gas plants — unlike coal or nuclear ones — can adjust their output fairly quickly to meet variations in electricity demand. This makes such plants at least potentially complementary to the variable and unreliable output of solar and wind power production. However, these latter power sources remain uncompetitive to the extent that kWh from gas-powered generation is significantly less costly than from solar or wind generation. The abundance of recent gas production in the US has for the time being at least made it harder for those renewable sources to be competitive. Permitting the export of natural gas might, some believe, tend to stabilize domestic natural gas prices at a somewhat higher, more sustainable level. If so, that would help narrow the cost gap somewhat. But even if gas exports are authorized, actually building more infrastructure needed for substantial LNG exports will take considerable time, protracted because of considerable opposition from environmentalists and others. In any case, coal and other fossil fuels will continue to be consumed globally because of rising and seemingly insatiable demand from emerging economies. So none of these adjustments in domestic energy supply and consumption will have any notable impact on global GHG emissions and potential climate concerns. That is, not unless and until new, breakthrough energy technology innovations can provide non-carbon energy alternatives that are competitive with fossil fuels without subsidies. Lewis, you are exactly right about the exact conclusions of the report. However, when picked up on some media sites, the assertion that methane leaks may be underestimated was highlighted (without qualification about remedy) which was used by anti-gas groups to further question the role of natural gas in a clean energy future. Regarding economics of natural gas vs. renewables, the situation in the U.S. and elsewhere are two completely different stories. In countries where feed-in-tariffs give wind and solar an advantage (relative to more expensive natural gas), the need for flexible dispatchable power has been very apparent. Natural gas fired plants are idled while power systems struggle to keep pace with the growth of renewables. In the U.S. we are seeing a simultaneous growth in wind (see the nifty USGS wind mapping tool: http://eerscmap.usgs.gov/windfarm/ ) but will continue to need flexible power. So the question becomes how can policy mechanisms encourage the development of renewables without straining the electric grid? A lot of the gas capacity coming online is intended to replace retiring coal (and nuclear). FITs don’t give wind and solar an advantage. That is, they do not reduce the high cost of those sources. Rather they destabilize utility economics by distorting supply and demand relationships — among other things, also raising overall energy costs. Making energy more costly effectively makes a community poorer. Of course, some would claim that ‘managing’ pricing via FITs or mandates and such aims at internalizing externalities. However the valuation of externalities is often murky and arbitrary — the negative externality of reduced income and increased poverty may be understated or ignored. Truly “cleaner” energy solutions may be worth some price premium — but one no greater than what the poor can afford and would be willing to pay. By “the poor” I mean people in the world’s developing/emerging economies. That is where energy demand is growing most rapidly. The latter also are where we see a general willingness to tolerate egregious environmental damage to create jobs and raise incomes. It’s not that people in those places like or are indifferent to toxic pollution. Synergistic solutions that can deliver a cleaner environment and lower-cost energy seem to be welcome. But poverty itself is viewed (and should be) as a toxic hazard. So again the operative standard should be to “make clean energy cheap” — without subsidies or mandates (another form of subsidy). If combining gas-powered generation with solar, wind, or other unsteady sources can — as a total, integrated system — deliver kWh reliably (viz., Harris’ comment) and at a real cost comparable to conventional systems (viz., Kiefer’s case here for coal and nuclear power), that would meet the standard. Otherwise, it may be an improvement but not yet a real solution. Lewis: The question is not whether natural gas (NG) has less climate impact than coal. The question is how do we supply energy without putting an undue burden on future generations. Even the question of NG vs. coal is difficult to answer. Over very long timeframes, NG may indeed have smaller climate impacts vs. coal. But switching from coal to NG will increase global temperatures almost immediately and they will stay elevated for decades before the slight “climate advantage” of NG will result in lower temperatures vs. continued use of coal. Of course, both coal and NG are bad for the climate, as they both emit CO2 and methane. NG may (over long time frames) be somewhat “less bad” than coal, but we should not confuse this with the fact that renewables (and other zero or low carbon forms of energy) are much, much better for the climate. Of course, NG is not really “replacing” coal. We are switching some domestic coal plants to NG and we are then exporting the coal we would have burned. So net emissions are going up. The climate doesn’t care at all where you burn the fossil fuel. It only cares what the total cumulative emissions are. And total emissions are going up, helped in part by an abundance of NG. Dan, the first question raised by Dawn was whether NG fueled power plants could facilitate the adoption of solar and wind power as part of the mix. The answer to that is a conditional yes. Dawn, among others, suggests that that capability can make NG a useful part of a trend toward de-carbonizing. Your comment seems skeptical of that. My point was at least partly consistent with yours. That, is combining NG with solar and wind by itself may be an improvement but not an adequate solution. Renewable energy for the most part (with some exceptions) costs too much and is not adequately reliable. Subsidies may shift and mask those higher costs but don’t reduce them, and subsidies don’t eliminate the liabilities. So, yes, as I said, shifting the mix of domestic power sources will have no significant impact on the continuing global increase in carbon emissions. That will require innovations that make non-carbon alternatives truly competitive, without subsidies or creative accounting. Accelerating creation of those kinds of energy innovations is a strategy I and many others favor. However, climate impact is not the only relevant question. NG clearly has much less negative environmental impact overall than coal does. So to the extent NG replaces coal use, it’s a net positive improvement. I also question your assumption that NG will not replace coal consumption globally. That’s probably true in the near term. But if NG production is expanded as extensively in the rest of the world as it has been in the US, it is possible that inexpensive NG could reduce at least some of the demand for coal in many places. Innovations in nuclear power technology — making it both less costly and safer — also could displace much coal use with an effectively carbon-free alternative. CCS obviously would be a game-changer. But that is a technical nut that seems very hard to crack. Yet other innovations might make the impacts of coal production and use less noxious. In their book, Turning Oil into Salt, Korin and Luft point out that through much of human history salt (NaCl) was one of the world’s most valuable commodities, precious enough to fight wars over. The reason: salt was the most effective and reliable means for preserving food. But the invention of refrigeration technology changed all that, making salt about as cheap and uninteresting as dirt. Innovation could do the same to coal. Lewis: I agree that NG can play a role in supporting renewables by helping fill transients through fast dispatch response. However, I am skeptical that increasing extraction of NG will help lower emissions. When it comes to global warming, in the short run, NG is as bad as coal (if not worse) and in the long run, it is only slightly less bad. And cheap NG not only offsets coal use, it also offsets renewables and other low carbon energy and, therefore, expanding NG use is actually worse overall than the prior status quo. While it comes as a surprise to most people, it turns out that you can’t lower fossil fuel emissions by increasing them! Renewable energy costs too much compared to what? The permanent warming of the Earth by +4ºC or more? You mentioned that it is difficult to calculate the external costs of burning fossil fuels. That is true, but that does not mean the costs are not real or are small. The Obama administration says the Social Cost of Carbon (SCC) is between $12/ton and $129/ton depending on model assumptions and discount rates. Of course, like most studies of this type, they are probably low-balling the true cost. Let’s take one example. On the business-as-usual emission path we are on, sea levels may rise 1 to 5m by the end of this century, so saying 5m by the end of the next century seems reasonable. What is the value of land value lost by that? The bottom third of Florida will no longer be on the map. Quite a few wars will be fought over diminishing land area and other resources such as food and fresh water. My point is that we must put a price on carbon to account for the destruction that fossil fuel emissions are causing. Renewables are far, far cheaper than fossil fuels when externalities are taken into account. I believe that a steadily rising price on CO2 (with all the money collected distributed to every resident on an equal basis) will not only stimulate the economy, but we will develop methods to eliminate CO2 emissions for less than the SCC. My day job is investing in cleantech technologies. Regarding your comment that CCS is hard nut to crack, one of our portfolio companies, Inventys Thermal Technologies, has done just that. They have developed a method to capture CO2 from coal and NG power plants for around $15/ton. That’s capture only (but includes the energy cost for capture), so total CCS with pressurization, pipelining, and injection would be around $35~40/ton. That’s amazingly cheap but there still is no reason that any power plant operator would use their system for CCS as long as polluting the atmosphere is free. But with a $50/ton carbon fee, almost all power plant emissions could be reduced by 90~95%. And at $100/ton, air capture of CO2 could be cheaper than polluting. Because renewable energy production peaks are generally earlier in the diurnal cycle than peak electric demand, and earlier in the seasonal cycle than peak electric demand, some other sources of dispatchable electricity are needed. Natural gas is scalable, and promptly dispatchable. So natural gas is a prime candidate for scalable electric dispatch. Without it, the use of renewables for electric production would be likely to reduce the reliability of regional electric grids. The availability of combined cycle gas facilities, and of co-located natural gas and renewable facilities is another element of positive synergy between renewables and natural gas as a positive resource for energy markets. One potential use of natural gas — that is not widely recognized — is as a “black start” resource for the electric grid. In event of a severe weather, or a severe solar geomagnetic storm, or a coordinated terrorist attack on critical electric infrastructure, a substantial segment of the North American electric grid could suffer an extended blackout. Existing “black start” pathways are largely dependent upon hydroelectric generation and transmission. Coal-fired plants with large on-site storage of coal, have had a capacity to participate in “black start” of other electric generating facilities. As coal generating facilities are retired, is there a role for natural gas-fired plants to substitute as “black start” resources? One of the potential limitations in depending upon natural gas as a “black start” resource has been the interdependency of gas pipelines upon electricity to maintain just-in-time availability of natural gas as a fuel. However, as the federal government considers licensing the export of liquified natural gas (LNG) at coastal or near-coastal facilities, the potential uses of LNG container-ships as a “black start” resource should be considered. If a “reserve” LNG carrier vessel is connectable to a coastal-site gas fired power plant, LNG could be a key “black start” resource for many of our near-coastal electric generating facilities. These generating plants could, in turn, provide “black start” capabilities for nuclear power plants that are dependent upon some external source of dispatched electricity to safely restart. Ultimately, breakthroughs in the storage of electric energy may provide opportunities to substitute stored electricity when intermittent solar and wind systems do not provide dispatchable power. Until that time, which may be decades in the future, natural gas provides a source of dispatchable electricity that allows the build-out of renewal energy systems. The concurrent reduction in net emissions of greenhouse gases, through substitution of natural gas for coal-based energy systems, is another of the synergies to be considered. Natural gas and renewable energy are already intertwined in many aspects. But in regard to the prior comments, geothermal, marine energy and hydropower, concentrated solar (with thermal storage) and biomass (including landfill gas, manure/sewage and cannery waste anaerobic digestion, and waste wood generation) are all 24 hour power and are already competitive in many markets. Obviously for the variable renewables such as solar and wind, natural gas (and the other aforementioned renewables) enable these sources to be more valuable. But conversely, many of the projects I have been involved in allow solar (electric and thermal), for instance, to reduce natural gas pipeline congestion during midday electric peaks for air-conditioning. Distributed solar, wind and combined heat and power (CHP) systems independently power natural gas pipeline pumps and controls and cathodic protection systems, making natural gas pipelines more reliable and resilient. There is a policy and media tendency to pit clean (and cleaner) technologies against each other rather than finding and encouraging the synergies, which make these technologies more valuable as part of the practical portfolio. So to sum up — renewable energy, high value energy efficiency, and natural gas have a synergistic and symbiotic relationship in our energy system, which should be encouraged and expanded — and in many cases which is already happening within the marketplace. Are a broken leg and a crutch synergistic? If so, then yes, natural gas can be the crutch to the broken leg of intermittent power sources that lack sufficient storage to be dispatchable. An even better choice, though, is coal, which is far cheaper, is fully domestically supplied, has low price volatility, and can easily store a 30-day supply of fuel on site, providing excellent black start capability without reliance on a vulnerable and capacity-challenged pipeline infrastructure. Providing even more independence from external infrastructure and an excellent black start option with sufficient capacity to help reboot neighboring plants back up to grid operations after a major disturbance is a mine-mouth coal plant. Mine-mouth coal plants together with nuclear plants, represent the most self-contained and self-sustaining types of power sources that also have a capacity great enough to support metropolitan areas and a power density high enough to fit within a physically defensible perimeter. Natural gas and petroleum onsite fuel storage is more vulnerable, as is the pipeline and rail and road infrastructure that delivers the fuel. Solar and wind power sources are much more vulnerable to damage from weather, let alone sabotage or terrorism, have extremely low power density and indefensibly large perimeters, and have seasonally/diurnally/arbitrarily variable and intermittent output which precludes their consideration for any on-demand application, particularly black start grid recovery operations. What is the new and special contribution that still expensive, still low-EROI, still highly-subsidized, still fossil fuel-dependent, still intermittent wind and solar are bringing to the grid this time that they didn’t bring in the Carter era when they faded into dereliction and the grid somehow managed to soldier on without them? Thank you for returning the discussion to the realm of common sense. The best I can do is offer support for your points. It seems this former Merchant Mariner and the Navy Share some common roots. Oil fired steam plants and gas turbines are probably the best for initiating power to a blacked out grid. Oh yes, if you have diesels that are large enough, that could be a bigger help. Modern nat gas fired gas turbines require very high pressure gas, because their air compression ration is very high. If adequate gas transmission line pressure is not available, they require a very large fuel gas compressor. This arrangement could be designed for black start, many are not. In any case, the grid outage could well be accompanied by loss of gas pipeline service. I need some help understanding your major point. A mandated federal study? You cannot actually believe that it would be unbiased? In any case we do not have to study it, monitoring will do. We are already well into living the plan to eliminate coal plants. The only possible replacement will be nat gas fuelled combined cycle plants, unless of course we are willing to give up grid reliability. A quick review of some of the above comments leads me to believe that many of our “Experts” are indeed willing to exchange reliable and economic electric power for some future relatively insignificant reduction of carbon emissions. “Insignificant” because China, India, etc. will increase their emissions faster than we cut ours. If we really were worried about man made global climate change, we would be building nuclear plants as fast as we could. Since we are not, I am not. As for renewables on the grid, they are there. Their unreliable operation must be, and so far, is being supported by nat gas fuelled gas turbines and some hydro plants, at considerable expense that no one wants to discuss. Why would you want this study? I may have missed your point. If EPRI were required (forced?) to do the study, would the results be forced as well? America’s requirements for electrical energy are not going away anytime soon. Our population is increasing, and even with EV’s becoming much more popular, the electricity at the outlet has to come from somewhere. Captain Kiefer had a valid comment about terrorism. What would happen if, and there was no source of stored fuel to put on line. 24 hours may not be to big a deal, but 24 days? We all know America can’t and does not want to be without our energy, electrical or transportation. I believe we have to become like our boy scouts or more importantly like our military. All the bases have to be covered, complete with spare backup. Solar and wind and hydro and geothermal and tidal are all very important, but there are times of darkness and no wind and other causes like drought that are not planned, but they happen. Then What? Plan B-C-D? Milton,we live in America. There are problems and situations that need to be dealt with and corrected, because we know there are these problems. It’s a leak, like a dripping faucet. Fix It! With the environmental organizations overseeing, and constantly “nagging” these “problems” will be dealt with. It’s like a rubber gasket in your garden hose, every once and a while a correction is needed. Just look at the wind farms. How many are not turning and or have these big oil streaks showing. How many solar panels were hit with a dust storm and are putting out 25%. It’s called situations. What if the coal power plants could be made to operate as clean as the natural gas power plants? What if the natural gas power plants could be set up to operate at over 90% thermal energy efficiency, having NO chimneys venting any exhaust, and near zero CO2 being vented into the atmosphere? How would they then rate compared to solar or wind? What if this exhaust were to create jobs and product. No exhaust. How would it then compare to renewable energy? My Chief Technical Officer a few years ago asked me, “What is a weed?” It is something that gets pulled out of the lawn or flower bed, and thrown in the waste bin to be disposed of. What if that weeds flower and petals could be pulled of, and added to a salad, and people wanted to buy it? Is it still a weed? What if we could show America that this coal power plant could operate as clean as a natural gas power plant? Let’s go one step more, as clean as the natural gas power plant operating at over 90% thermal energy efficiency. Coal power plants with NO chimneys. If ALL of America’s Energy Sources could be “In Step” with each other, Where Would America Be Rated In The World? We are in America, and this is possible. There are of course government hurdles, but we believe these hurdles will be overcome. America needs to plan with it’s future, and as this started, America Needs Energy, Lots Of Reliable Energy. Guess what? We Have It. I will attempt to summarize some of the points made thus far and provide additional context. 1. Carbon emissions from natural gas over the short and long-term: Several comments addressed whether using natural gas provides climate benefits in the short or long term because of a) leaks and potency of methane and/or b) replacing coal with natural gas in the U.S. results in coal being shipped and used overseas. With regard to carbon benefits, where I see the greatest emissions benefit is the use of natural gas as quick ramping/cycling capacity to balance renewable loads. So if you can as a whole move the energy system to incorporate greater use of renewables without increasing emissions from the cycling of fossil plants (more on that later….) then you have a net win. Interesting to me is that people generally do not focus on life cycle carbon emissions from any other source, only natural gas. Regarding coal exports, there are plenty of other countries in the world that are net exporters of coal with large reserves, namely Indonesia and Australia. Even if the US does not export any coal, cheap coal (particularly lignite) will continue to be in demand which has a higher emissions burden, not just for carbon but other pollutants. The abundance of coal on the market may adjust global prices down but the demand for coal is primarily driven by developing economies that are experiencing rapid industrialization. Coal fueled the U.S. industrial revolution because of its abundance and reliability, the same is true for other countries. 2. Black start capability: cyberterrorism and extended outages due to natural disasters are real issues that must be mitigated. Fuel supply is an important consideration for black start capability. So this potentially exposes generators reliant on natural gas if there are pipeline disruptions. However, coal can be stockpiled on site. The average number of days of burn at U.S. coal-fired power plants has been between 2 and 3 months, according to EIA. And mine-mouth plants would have no issues regarding stockpiling providing fuel security. A true definition of flexible power should include multi-fuel capability and the ability to immediately (without shutdown) to switch to HFO, LFO or synfuels if there is a disruption in the natural gas supply. There are technologies available to do this, that also provide the ability to start up and shut down within minutes. The IPP3 power plant being built in Jordan is a great example. Because the national electric company there was concerned about natural gas disruption (which had previously happened), multi-fuel capability was specified. The plant will be able to utilize a variety of fuel sources. With regard to renewables (not just wind and solar), the more distributed the energy system becomes, the less vulnerable it is to extended widespread outages. That is why microgrids are being looked to as a solution (see Conneticut’s pilot program). Notably, the U.S. military is actively deploying microgrids that integrate renewables because it provides energy security. 3. Clean coal: the debate over whether coal should continue to be part of the energy mix has been raised. With regard to balancing renewables and provide grid stability, coal units generally cannot startup, stop or change load rapidly. So their most economic use would be as baseload units. Quick ramping and cycling of coal plants can be accomplished (see RWE’s BOA 2&3 lignite plant) but the majority of pulverized coal plants were not built to cycle. Whether coal should be part of the energy mix is an entirely different discussion, and one that has been well commented on elsewhere on this site. 4. Feed-in-tariffs and other incentives to encourage renewables. The subject of incentives or subsidies to alter the economics of certain energy sources relative to others is certainly one of the most hotly contested topics. My point was not to debate the efficacy or merit of doing so, only to point out that where high levels of wind and solar are being integrated, flexible power that can ramp up quickly or curtail load is needed to stabilize the electric grid. 5. Quantification of externalities/life-cycle analysis/cost-benefit analysis of energy sources: These types of studies are notoriously complicated and highly dependent on input assumptions and data. I’ve worked on these analyses and they are subject to interpretation. If we are going to look at social costs of coal, then would we also need to look at social benefits? Are the costs and benefits of renewable sources including extraction of input elements properly accounted? My personal view is these types of discussions lead to policy getting mired in ambiguities, resulting in nonaction. 6. Even renewable sources can be subject to disruptions in supply. We understand the limitations of solar and wind, but I would submit that hydropower (look at California or Brazil) and biomass (limited supply chain distances) can also be disrupted. To capitalize on synergies between natural gas and renewables, should policy be crafted to encourage hybrid (multi-source) complexes? An example is the Martin Next Generation Clean Energy Center in Florida that uses combined cycle natural gas generation to supplement solar output. Why are we not concerned with human poverty and its causes? No economy can lift itself from poverty and remain prosperous, absent reliable low cost energy. How can we demand an accounting of externalized costs, but no accounting of externalized benefits? Why are we doing this? Having lifted ourselves, it seems we now dislike prosperity. Prosperity is too unsafe? Too costly? Is our future damaged by our prosperity? How do we CONTROL it? Did you see the Hatchet Job National Geographic did on coal?? Coal was the foundation of reliable low cost energy that built our prosperity. Sure, something had to be done to mitigate the damage it was doing. It certainly was damaging. And now, that we are prosperous, something has been done. No need for Nat Geo to be piling on. Thanks to the folks that developed horizontal drilling and fracking, we no longer need coal to support our society. We don’t even need OPEC. Remember how we got into this mess with petroleum? Back when we had no electricity, we made kerosene from crude oil, and used it to light up our homes. Whale oil cost too much, and candles were no where near as bright. How about those good old days? Jack – your comments is what a lot of developing nations are saying about the U.S. – we developed our prosperity using coal and are now telling other nations not to do the same thing – quite hypocritical. Of course we have learned a lot since the early days of coal burning, where there were no emissions controls. Similarly, the majority of the U.S. public believe climate change is a significant threat that must be addressed. Because over 1 billion people worldwide still lack access to electricity, we need to find ways to address energy poverty (which includes not making electricity too expensive) while also not unduly putting the burden of pollution on the poor. In my opinion, the answer is not “do away with coal” nor is it to abandon renewables. Because coal remains the most abundant energy source worldwide, I believe we must find economically viable ways to minimize the environmental impact of coal. And I believe that renewables need to be integrated in a sensible way, that doesn’t distort power markets. Please substantiate your claim for military microgrids increasing energy security with some quantitative data on location and performance. The US military, subservient as it is to its political masters, is doing a lot of things that are degrading energy security and national security right now (buying $59.00/gal biofuels, killing the A-10, paying more than $300 million per copy for F-35s that burn more fuel and carry fewer weapons than $50 million F-16s, etc. ), so their actions are not automatically a litmus test for what advances the national interest. Not one of the solar farms or wind turbines installed on military bases since 2001 documents any capability to provide power when the municipal grid goes down. In the cases I researched in depth, the projects were all far too expensive to have any money left over for automatic transfer switches and dedicated circuits, so they were dropped or never contemplated in the first place. So all these facilities, despite the celebrity visits and photo-ops, add nothing to energy security for these bases — if the city loses power, the base loses power. In all the cases I have researched the project cost was far higher than the projected lifetime energy cost savings (e.g., 83-yr payback for Nellis AFB’s 14MW solar array). These boondogles are examples of tax dollars spent hastily to further careers rather than with respect toward the federal taxpayers and state taxpayers and utility rate payers who paid for them. Here is just one study done by the military upon itself that documents how ARRA funds for energy projects failed basic business case economics and should never have been approved in the first place (The Department of the Navy Spent Recovery Act Funds on Photovoltaic Projects That Were Not Cost-Effective. Department of Defense Inspector General, September 22, 2011. http://www.recovery.gov/Accountability/inspectors/Documents/D-2011-106.pdf). I am always looking for an exception to the rule of what I have found above, so I genuinely invite you to provide that exception. Please enumerate the cost-effective benefits of “microgrids that integrate renewables,” and the cases where they have quantitatively improved US military energy security. Ike, I have looked at reports by Navigant Research on military microgrids. The energy security issue relates to having to acquire and transport fuel for operations and as such, cost is less of a consideration. You certainly can say that is not effective for use of taxpayer dollars, however DoD investment has also helped with getting commercializing the technology for other applications (i.e. remote microgrids where electric power transmission is not available). The microgrid at Fort Bliss went online last year and does have islanding capability. There are other microgrid demonstration projects and investments, including the ISBPS which is a lightweight microgrid asset that can power a mobile air base. But let’s not derail this discussion with a debate on the merits (or not) of microgrids. I am using “energy security” in the military sense which is “assured access to energy.” Cost is only part of that consideration. That being said, your example of a “microgrid” at Fort Bliss is a $2.4 million backup power system for a single building (the dining facility). It consists of a diesel backup generator, a 120-kilowatt solar array, a 300 kilowatt energy storage system (banks of batteries housed in a pair of shipping containers) and utility grid interconnection. They could have stopped at the diesel generator and automated transfer switch and saved $2.2 million of that $2.4 million. So does every building with a backup generator that allows it to be powered autonomously now qualify as a microgrid? The ISBPS demonstration has at its core . . . another diesel generator. Bolting on some solar panels and a couple truck loads of batteries as fig leafs do not obscure what component is doing the heavy lifting of energy production. The phenomenon here is bigger than just microgrids and directly applies to the discussion topic of whether fossil fuels are synergistic with renewables. Here is real-world example of actually fielded solar power (GREENS) versus conventional diesel generator power (ITEG) in a tactical military application: powering and cooling a combat operations center tent full of radios and computers. 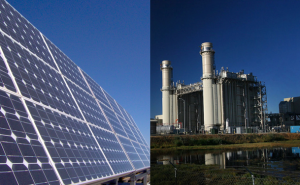 Which of these generation solutions provides greater energy security? Which imposes the least demand on logistics and convoy resources? Which has the lightest and least vulnerable battlefield footprint? Which exposes the fewest Marines to enemy attack? Which satisfies the MILSPEC requirements for all weather operations including hours of darkness, rain, and blowing sand? Which is the crutch and which is the broken leg? Hint 1: The entire daily power output of one GREENS is less than that produced by the ITEG with a single gallon of diesel fuel. Hint 2: It takes 195 man-hours to take down and set up the 584 solar panels each time the unit needs to move. Hint 3: Transporting the GREENS units into theater and around the battlefield consumes far more liquid fuel than moving the ITEG. Hint 4: The weight difference in equipment alone is equivalent to 5 months of diesel fuel for the generator. Hint 5: Ammo, food, and especially water rival fuel for the mass moved daily by convoy and exposing troops to IEDs and ambush attacks. Hint 6: Marines are the least expendable and hardest to replace commodity on the battlefield. Again I will reiterate that just because the military is doing something with renewable energy does not mean it is good for energy security, good for national security, or even sane. However, it was most likely good for someone’s job security. I would like to see the federal government mandate a study by the U.S. electric power industry, possibly managed by the Electric Power Research Institute (EPRI), to examine the feasibility and costs of supplying all U.S. electricity demand from renewable sources (solar, wind, hydro, geothermal) supplemented with natural gas as necessary because of the intermittent nature of solar/wind power. Under this study, all existing coal-fired plants would be retired over time (different scenarios could be examined), and existing nuclear plants would be phased out over a longer period (possibly to be replaced with some newer-generation nuclear plants). Such a study would clearly show the costs for the nation to phase out coal-fired power plants and achieve a clean, reliable electric power infrastructure that would be acceptable to the electric utilities. Prof. Mark Jacobson of Stanford et al has done preliminary studies of converting the world’s energy system to all renewables, but there seems to be significant opposition to the realism of these recommendations. A federal government mandated study by the electric power industry would force the industry to come up with a practical plan and estimates of the costs of achieving this. The costs could then be compared to the estimated benefits from reduced global warming if similar plans were instituted worldwide to eliminate coal-fired power plants. As I’ve mentioned before in natural gas discussions, the EPA should be given the responsibility to ensure shale gas environmental concerns are properly addressed before expanding shale gas production. This includes determining the methods and costs for eliminating methane emissions, preventing contamination of groundwater, safely disposing of wastewater, and minimizing water consumption in fracking. My view is that we cannot make progress on these issues until the federal government takes the initiatives to require the electric power industry and EPA to assess the feasibility of using renewable power sources and natural gas in a synergistic way to meet the future electric power requirements of the nation. Going beyond electric power and the EPA, the federal government should mandate similar initiatives be taken by the oil and gas industry and automobile industry etc. to develop a strategic plan for phasing oil out of the transportation sector and replacing it with renewable-powered electric vehicles and natural gas vehicles. The entire nation of Germany is your ultimate case study. Their top-down mandated Energiewende campaign to adopt renewable energy has been paid for by extracting more than $100 billion from residential rate payers so far, with another $32 billion in umlage scheduled to be extracted from their wallets in 2014 at a rate of 8.5 cent/kWh in surcharge. That money has in turn been given to solar power and other “renewable” generators at a subsidy rate that averages 23 cent/kWh produced, allowing them to completely undercut the conventional wholesale power market and push the national utilities and dispatchable generation to the brink of collapse. Since no profit can be made in such a distorted wholesale market, retail rates have suffered. This national program has doubled the price of residential electricity to more than 39 cent/kWh for the average citizen, with the poorest paying 55 cent/kWh. Compare this to 12 cent/kWh as the US average. Interestingly the EU stopped even keeping records after the Q2 2013 because it was simply serving to document how their green energy policies have caused the price of electricity to skyrocket across the continent and UK and engender energy price protests that have turned into riots. BTW, policies that result in raising electricity rates serve as a giant regressive tax that hits the poorest the hardest. So what climate change mitigation benefit have the Germans bought with all that national treasure and damage to their economy and undermining of their international competitiveness and self-induced energy poverty? Well their annual CO2 emissions have increased year-on-year for three years in a row, dwarfing the reductions claimed by the rest of Europe generated largely by the great economic recession since 2008 rather than any transition to green energy. They have come to regret their dependence upon natural gas for reasons of price and political manipulation (e.g., Russia just raised the price of natural gas to the Ukraine by 80% this week), and have let their gas power plants languish while building new lignite coal-fired plants at a breakneck pace — the “dirtiest” coal from a carbon emissions standpoint. Their decision to prematurely decommission scores of billions of dollars of nuclear power plants dovetails nicely with the rest of their folly. In this single country you have the example of the pied piper: a popular but energy-illiterate prime minister and government pumping out to the people the feel-good rhetoric they want to hear while leading them right to the edge of the precipice with insane policies that are measurably achieving exactly the opposite of their stated goals. Sound familiar? Energywiende is not progress, but an unsustainable parasitism where everyone loses when the conventional grid operators collapse. Then the Germans will have only the 5.4% of their annual power actually delivered by solar to live on during the day, and the trees left in the Black Forest to burn for fuel to keep them warm at night. There is a policy that will dramatically reduce carbon emissions without the problems you cite in Germany’s case. With a “Clean Energy Credit” policy, a rising price is put on the carbon content of fossil fuels. The fee is paid by the fossil fuel companies at the mine, well, or port of entry. 100% of the money collected — every penny — is paid out to every legal resident on an equal basis. Because about 80% of CO2 is generated by 20% of the population, most people would earn more from the dividend than they pay in higher energy and product prices! Since the poor tend to use much less CO2 than the rich, this policy is not regressive. Furthermore, as the policy works to reduce carbon emissions, the monthly payments would decrease and the public would demand that the fee be increased! What other “tax” works like that?! Also, to reduce global emissions, a border duty would be put on products coming from countries that do not have their own fee on carbon. Those countries would be faced with the choice of sending lots of money to the United States or keeping it themselves. They will chose to keep it themselves. A rising price on carbon will create millions of jobs and stimulate investment and innovation in a way that will put the Internet revolution to shame! Are you being facetious, or do you really not understand the dependence of the fiscal economy upon the energy economy? That if you raise energy prices with a tax, you raise the prices of all cultivated crops and all manufactured goods and all transported goods and all energy-dependent services? And that those goods manufactured with fossil fuel carbon energy include solar panels and wind turbines and batteries and the ammonia fertilizer that makes our food and biofuels? And when you raise prices for food and transportation, those are very regressive taxes? Raising the price of energy and imposing Smoot-Hawley protective tariffs is the absolute opposite of a stimulus plan that will create jobs. The historical record is clear: high energy prices are correlated with recessions and depressions, high tariffs are bad for trade and economic competitiveness. George Santayana is rolling over in his grave, while Frederich Hayek and Milton Friedman and Howard T. Odum are about to leap out of theirs. Are you not aware that the fiscal economy depends on having a livable climate? I assume — but I hope I’m wrong — that you do not believe that climate change poses a real and present danger to our country and the world. Fossil energy only seems cheap because we are not paying directly for its external costs. But those costs are real… we pay higher taxes, insurance bills, food prices, and health expenses right now because of the external costs of fossil fuels. And that’s before the bigger impacts that are coming our way — like wiping out the bottom third of Florida. Sir Nicholas Stern called climate change the biggest market failure in history. If you read my description of the Clean Energy Credit, you will see that 100% of the fees collected are returned to every legal resident on an equal basis. So yes, most prices will go up (but not by much… an eventual $50/ton price on CO2 adds $0.50/gallon… and that assumes that we don’t find better ways to use energy (e.g., charging an electric car costs the equivalent of about $0.30/gallon)). But since poor people don’t use nearly as much CO2 as rich people do, they will make more money in the “dividend” than they pay in overall higher prices. The rich will pay more, but they will barely notice it. And everyone will do better because there will be enormous sums invested in innovations to reduce emissions. Of course, if you believe that climate change is not real or won’t be a big problem, all these ideas to reduce emissions are just a waste of time. But the science is clear. We need to dramatically and urgently reduce greenhouse gas emissions. The question is what is the best way to do it. The Clean Energy Credit is the best way I’ve heard to use market forces to get the job done. Thanks very much for pointing out the cost of Germany’s renewable energy program. However, you are ignoring the future costs of global warming to society, and not attempting to address this problem. The most effective way to reduce greenhouse gas emissions in the electric power sector is likely going to be to move to a renewable energy/natural gas synergistic power infrastructure, possibly with some advanced nuclear power plants as well. The United States and other countries have to properly estimate the costs of doing this versus the benefits of reduced global warming if all countries take the appropriate actions. Assuming your Germany renewable energy program figure of $32 billion additional costs in 2014 and comparing that to Germany’s GDP of about $3.6 trillion, this is an additional cost of about 1% of German GDP. The estimated costs of global warming from studies I’ve seen are typically higher than 1% of GDP: the NRDC estimates costs between 1.8% – 3.6% of GDP, and the original Stern study of the economics of climate change estimated long-term costs of 5% – 20% of GDP. So the German case does not negate the net economic benefits of moving to renewable energy for electric power as long as every country does its part to properly address the global warming issue. All countries must act effectively to halt global warming, and the U.S. should be leading the world in making this transition by doing the appropriate studies and strategic plan development. The international competitiveness issues will be overcome if all countries agree (under the UN climate change framework) to bear the required costs to reduce their greenhouse gas emissions according to such well-developed strategic plans. Lower-income people in the U.S. and other countries will have to be supported through income redistribution schemes, but must still be encouraged to be energy-efficient and consume less carbon-emitting energy. Henry, I agree with your thoughts for a study that looks at the cost implications of phasing out coal and moving toward 100 percent renewables (or other target). EPRI would be a good organization to conduct such a study. I have previously conducted studies for them and they are in my opinion a very balanced organization that has the expertise to understand the fundamentals of the electric power system. They already have a regional dispatch model developed (PRISM). I am not sure to what extent they have run the model, at one point I know they were looking at implications of various prices on carbon. What I would want to see as output of such a model is optimized dispatch (for reliability and cost) based on different policy scenarios, and what the probabilistic cost impacts are to consumers. The criticisms of the Stanford modeling is that is not a dispatch model that integrates reliability constraints. Instead it is focused on resources. So kind of pie-in-the-sky analysis. Regarding Germany’s experience, they have certainly made some missteps, which can be learned from. They phased out nuclear too fast, must import gas, and aggressively pursued putting wind on the grid without thinking through the transmission constraints and need for power plant cycling. Their experience (and how to avoid the pitfalls) can help inform policy in the U.S. and in other countries that are trying to move toward a cleaner energy future. I am certainly not ignoring climate risk or the associated costs. In fact I pointed out how Germany’s policies are making the problem worse by increasing CO2 emissions. Policies and programs that lead to increased GHG emissions are no cure, wouldn’t you agree? They should be halted and re-examined, wouldn’t you agree? If you read my several posts on social costs of carbon and externalities and GHG emissions you will see that I advocate a scientifically rigorous, empirical, and even-handed approach to making policies to address the risk of climate change. That I argue to make them more effective by not repeating the critical errors of most current initiatives that demonize only CO2 instead of all non-condensing, well-mixed, anthropogenic GHG; that count only operational phase emissions instead of full lifecycle emissions; and that accelerate the use of fossil fuels by using them inefficiently to subsidize lower-EROI energy paths. By uncritically promoting renewables and carbon taxes against all evidence that they are doing more harm than good, you are the ones recklessly putting the future climate at risk. You are giving the patient bad medicine and claiming it is not working because the dose is too low. Well, I seem to be getting rocks thrown at my statements from both sides of the argument. Good, they were well placed. First of all, Captain Kiefer, thank you for your service to our country. Secondly, I’d note that it’s difficult to ascribe the improvement of London’s air during the 20th Century to the salutary effects of an electric grid. The development of that grid coincided with the demise of the coal-gas industry, one of the sources of very large amounts of coal-derived pollutants. That gas provided home and street lighting. It was no longer needed after electrification. Basically, London’s air quality improved because the burning of coal was made more efficient by consolidating its large scale use in generating plants outside the city. BTW, our national wealth wasn’t built on cheap coal, it was built on cheap oil: we were the Saudi Arabia of the 1st half of the twentieth. That it was built on cheap energy in general is not a matter of dispute. That option is no longer available to emerging economies, with the possible exception of shale gas. We should export the technology, not the gas. Arguing against “electricity for the masses” is a bit like dissing Mom and apple pie: hard to get a lot of traction there. Still, it’s difficult to understand why those huddled masses would yearn for the most polluting fuel available (or imaginable, for that matter). Certainly the citizens of Beijing, many of them nearing the drop-dead-like-19th-Century-Londoners stage of coal fired industrialization might question the intelligence and efficacy of taking a bad path simply because it’s quicker. Clearly, the Chinese find themselves up against a hard wall of the cost of environmental externalities. For some of them, that cost may be an existential one. Not to worry: China has extensive shale gas potential. We should stop burning our coal and start taking further advantage of the energy price disparity between oil and natural gas by converting the coal to liquid hydrocarbons. That and the advent of NG-based alcohols for motor fuel will steal another march against CO2 pollution. Not to mention increase our energy security. The EDF and the NRDC have both issued reports that say the gas industry can curb their methane emissions considerably with expenditure equal to 1% of the industries’ capital expenditure. Leakage in the pipelines, leakage at the wellhead and capturing, not flaring, the gas at the wellheads can all be done at very little relative cost to the companies… some say 1% of their annual capital expenditure. Those actions would make a difference. I agree with Henry that it will take federal action. Getting the companies to do something that brings home their externalized costs is another matter. Exxon, a major fracking leaseholder, has just released their promised ‘risk assessment’ of their carbon assets. The evaluation was requested by Exxon investors. Here is what the CEO said … ““We know enough based on the research and science that the risk (of climate change) is real and appropriate steps should be taken to address that risk, but given the essential role that energy plays in everyone’s lives, those steps need to be taken in context with other realities we face, including lifting much of the world’s population out of poverty.” This from the most profitable corporation the world has ever seen! Finding a way to explore possible synergies with the fossil industries for the sake of the communities’ health is wishful thinking. In VA Dominion Power has presented an asset plan to their regulators that would increase greenhouse gas emissions by 37% in 15 years. They have also submitted a separate option that would build 1,600MW of offshore wind on leases they won from BOEM and placed on ‘layaway’ with no financial commitment to building. They have stated they will only move to cut emissions and build those offshore winds farms if they are required to. Certainly the VA Legislature sure won’t require anything from the company, even in the face of new levels of flooding from rising sea levels in Hampton Roads. I used to think that gas could fill the transition to solar and wind until storage became less costly. I no longer believe that we need to build additional gas for electricity use. There are other uses for gas that will be harder to replace and studies have shown that additional natural gas is not needed for the system to produce reliable and cost efficient electricity. It will take awhile to ramp up. When we get to the magic 30% renewable integration by then storage should be ready to play its part and its part will be defined as on-site storage at efficient sites, not major centralized storage facilities. Try The Solutions Project from a Stanford Professor and The Economics of Grid Defection from RMI, who say that on-site battery storage at a reasonable cost is coming not too far down the road. Also Willetts Kempton from Univ of DE in The Journal of Power Sources vol 225 3/2013 who has modeled 99.% renewable electricity for the PJM market. Then there is the issue of Fracking. I do think that when the former CEO of Exxon has joined the protests against new well fields north of Dallas near his home that the cat is out of the bag. Is he worried about his town having no water left? about the fracking chemical in the air? or the possibility of earthquakes? All of those things have happened and been linked to the fracking process. Rules are being written that should include low water level geographical areas as off limits, reduction in the use of toxic chemicals in the fracking process, and who knows about the earthquake issue. LA has called a halt to fracking on the San Andreas Fault … a move that is very reasonable, I think, in light of other examples that appear to be linked to fracking. Finally, a la Dawn’s summary … quantifying those externalized costs is necessary. Who cannot agree that we need a level playing field? The Harvard study a few years back did that for coal … and now Minnesota is replacing net metering with VOST … value of solar tariff that includes more than installation cost. We need a carbon tax and who will take away the fossil tax write-offs? Coal certainly did fuel fueled our industrial revolution because of its abundance and reliability, but it does not look like that will be the same for the developing countries. They have the advantage of not being locked into a centralized system first. China, India and Brazil will develop a different path. China’s transition is being planned with RMI’s help and they are moving quickly. They will lead the way to the new energy structure. That new structure will be made up of Fort Carson’s zeroNet micro grid and UC San Diegos where gas works as a co-generation plant, lots of community and individual rooftop solar, and I do love the 10 Island Challenge of Richard Branson’s that is building renewable energy to replace the diesel fueled electricity on the islands in the Caribbean. With a recalcitrant Exxon and proposals like Dominion’s, let’s keep natural gas for other things for now. We don’t need it for electricity. Are natural gas and renewables necessarily competitive, or should they be viewed as complementary? I’m going to digress a bit here. I think all the answers posted weigh-in the no-single-answer-is-right to question. – I want to come back to a word I really try avoid using: “sustainability”. This term meaning balancing the well-being of people, economic growth, and the environment we are part of and depend on. Ultimately who is in-charge of Earth’s sustainability? –you and I are. But who creates incentives, advocates, and pushes for or against it it? – Our government’s policies, interest groups, financial markets, John and Cecilia in Salina, KS, Russia, China, Brazil? A sustainable planet is the sum of its parts, parts that make us and divide us – Each country, each region with its own natural resource, societal, political, economic, national security, etc. characteristics and needs, yet we are all interconnected and interdependent like it or not. On top of us humans are much bigger actors: nature that really does not care what we do or don’t do, it plainly responds according to natural laws and larger astronomical phenomena. – Humans are part of the (planet Earth’s) system, we are not the system. However, as a species, our impact is and will continue to be immense. We have an opportunity to either make our life easier or harder in the decades to come. A possible answer is “it depends”- as in business. However; we have a fragmented understanding of the big picture and that can blind us. We tend to look after our own self-interests and a quick fix. Consensus is extremely hard to reach, but not impossible. Ask a US Congress representative for an answer, ask a coal miner or a fracking company in Pennsylvania or West Virginia, ask our DoD or DOE leaders, ask an official India or Germany and you’ll get a different answer with certain common intentions. Each situation is different and policy options are highly dependent on specifics, timing, and risk. Providing the poor with electricity will do no good if you destroy the climate in the process. Having electric lights but not enough food or fresh water is not a good tradeoff. While everyone would like to continue the status quo, that is not one of the options being made available to us. Either we change the path we are on or Mother Nature will change it for us. Dan, Using hyperbole and false assertions, like the oceans will rise by 1-5 meters in the next hundred years (the truth: http://en.wikipedia.org/wiki/Current_sea_level_rise) is NOT helping the environmental cause. Using phrases like “destroy the weather” does not help either. The earth and the weather will be just fine. As will humanity – it will adapt. As for capturing the CO2. There is a market for CO2. Oil companies and even fracking operations need CO2 for CO2-EOR and as additive to the fracking operations (and soon, waterless fracking using CO2). The going price for trucked CO2 is north of $150 a ton. If your solution is good, why not go out and compete in the marketplace? Last, the world needs more energy and for less cost. It is incumbent on us to commercialize such technology in the most environmentally responsible way. For example, the Colorado anti-venting regulations is creating a market for small size NG processing plants. Once that market is created, the captured natural gas liquids will more than pay for the distributed processing. The exact same thing happened with green completion. Initially it was a novelty. But today it is accretive to field completion hence its the norm. Remember, carbon starvation equal real starvation. That does not mean that we should succumb to pollution. If means that low cost should be the target of renewable fuel development. 1. Nothing can be achieved without the use of energy. This is a basic, thermodynamic truth. Go argue with Max Planck if you don’t like the assertion. Very little can be achieved without the employment of economic sources of concentrated and portable energy, particularly anything beyond the feudal societal model. 2. The “global environment”, when viewed at the broadest level, is a heat pump that employs solar energy and tectonic processes to restore baseline atmospheric chemical and particulate balances and move waste toward the abyssal deeps. Being a physical plant, it necessarily has a maximum capacity. It appears we are currently exceeding that capacity. We continue to do so at great risk to our well being. 3. Soaring atmospheric CO2 levels have achieved prominence as a proxy for that excess. Along with an extraordinarily long list of other substances, we need to reduce our carbon output as rapidly as possible. 4. Without question, the shift from burning coal to burning natural gas for generation has made a greater contribution to that goal than renewables and conservation combined. 5. We can not fully shift to renewables in our lifetimes, for both technical and economic reasons. Those difficulties may or may not be surmounted. The bottom line of this extended syllogism suggests the appropriate response to anyone who wishes to disregard or do away with our current natural gas surplus is “Are you nuts?” While much has been written and discussed regarding the hidden costs of natural gas – leaks; pollution from hydrofracing – these are regulatory problems. The arguments against natural gas take the form of indictments of industrial processes as opposed to indictments of the individuals involved in executing them badly. For those who believe that only economics is critical, hence burn more coal, I would invite you to research the history of London during the Industrial Revolution: people routinely dropped dead from breathing that coal-polluted atmosphere. To answer the original question, yes, there are “synergies” between natural gas and renewables. Both solutions should be pursued with vigor. Stop arguing about how we do it and make the most economic achievement of CO2 reduction dispositive of the question. Joel, I always appreciate your ability to get straight to the point. I agree that reasonable regulations could address many of the leak issues. As the Science publication noted, a small number of “super-emitters” are responsible for a large percentage of the leaks. With increasing renewable capacity coming online, valuation for merit order which addressed the need for flexible power (not necessarily just natural gas – after all pumped hydro and energy storage can help balance loads) could be quite beneficial. Regional power system dispatch could be optimized for lowest carbon emissions and highest overall system efficiency within existing transmission constraints by incorporating the true marginal costs of intermittent renewables. As in most things, the truth here is more complex than the popular perception and emotional narratives. The air quality in London today is better than it was in the 1600s before the start of the industrial revolution, and the turning point for it getting better was the advent of coal-fired electrification, not environmental protection legislation. This excellent study of the history of London air quality is worth a good long look by those truly interested in improving air quality and addressing externalities in energy policy (Brimblecombe, Peter. The Big Smoke: A History of Air Pollution in London Since Medieval Times. Methuen, 1987). Urbanization is what ultimately kills populations as their resource hunger and waste streams are concentrated and exceed the capacity of the local geography. Before coal and oil, biomass fed the energy appetite of cities and resulted in the deforestation of whole continents to feed them. History records a pattern of great civilizations burning up their accessible agricultural resources and rapidly declining into oblivion. If you want to change a climate, deforestation and loss of soil moisture can give you an instant dust bowl and do irreparable damage far faster than pumping up the atmospheric CO2 a few parts per million. Portions of the middle east and the Anatolian peninsula (i.e. Turkey) used to be much greener and filled with wild game. Lebanon was famed for its forests of giant cedars in 1000 BC. The devastation of these areas was anthropogenic, but via agents far more potent than CO2 — the same agents of land and water profligacy we are invoking again with our misguided biofuels policies. The fact is that fossil fuels and electrification have liberated modern civilization and its urban populations from dependence upon biomass resources for cooking and heating fuel, and have thereby helped preserve the environment and human health. Indoor and outdoor air pollution from wood, charcoal, and dung fires kills 2 million people per year according to the WHO. The millions not similarly dying in the developed world are a positive externality that should be credited to an electric grid largely energized by fossil fuels. Even a large primitive, pulverized coal power plant that is located on the edge of a city and exhausts its unscrubbed smoke 300 feet in the air above the inversion layer, but pumps energy into urban homes as electricity instead of fire is far better for the health of that population than each of 10,000 homes in close proximity having a billowing chimney of their own connected to an inefficient fireplace that must be fed by endless armloads or truckloads of fuel transported through the streets and handled by residents and stored in homes. Electricity also brings water sanitation and street lights and modern hospital care and telecommunications and other benefits that improve quality of life and longevity. The developing world is literally dying for some of the benefits of such a grid, and coal power plants offer them the fastest, lowest CAPEX, most easily fueled and maintained path to the huge QOL and health and environmental improvements that electricity brings. Urbanization without electrification is lethal — for the population and the environment. It is simple mathematics that urbanization quickly exceeds the carrying capacity of agricultural energy resources. Post-industrial age urbanization likewise exceeds the carrying capacity of solar and wind power without the dedication of thousands of square miles of the environment to energy collection and the advent of still technologically distant cost-effective electricity storage. I wish we could get the 300 watts of power per square meter of environmentally-impacted land from solar power that we get from a fracked gas well, but the reality is only 6-8 W/m2 from today’s newest commercial-scale solar farms. I wish the cost of electricity storage rivaled the $0.10/kWh of diesel fuel instead of the cheapest option being $500/kWh LiON batteries, but wishes do not make good science or good policy. It is counter to the “clean” and “green” narratives, but, per unit of energy service delivered to civilization, fossil fuels have far lower environmental and climate impact than “renewables,” even counting the spills and wildlife kills, and their postive contributions to human health and longevity far outweigh their negative aspects. We need policy-makers who know history and can do math. “Renewables” as they exist today are simply not a viable alternative, and policies that pretend they are hurt everyone. Well said, and well researched. thank you. The wind power subsidy that recently lapsed in the U.S. was worth $23/MWh. With natural gas prices so low, wind power developers (including utilities) are saying wind power can’t compete. Should the wind tax credit be extended? If not, what policies would help encourage investment in renewables AND/OR improve the economics and reliability of electric supply? Ike, I do love the idea of spreading ‘pixie dust’. My little granddaughters would think that especially fine! And I love the stories from London. The King instituted a death penalty for burning sea coal but since no one had an alternative it did not stop the use of sea coal. The other piece of the report that I loved is the fact that hydro was not used because it is not available everywhere and because the report states … “Hydropower makes the problem of high penetration renewables too easily solved”. Since I have been arguing all this ‘renewable abilities’ for 4 years here in VA where Dominion has a nice amount of hydro … I think that sets us up just perfectly here! You provide some numbers from the Kempton report. I could begin by impeaching the source (the authors, 1. used 1-hr resolution for modeling renewable output when such output can vary dramatically over minutes and seconds, 2. added arbitrarily calculated externalities to cost of fossil fuel electricity, 3. assumed storage battery life of 15 years, 4, incorporated data from the Jacobson & Delucchi’s fantasy piece that you admit was not scientifically rigorous, etc.). Disregarding this, let’s take their numbers at face value and explore what they really say. First, for context, understand that the current national average for grid reliability is 99.98%, which equates to a single outage of less than 1.5 hr per year from a customer perspective. Settling for only 99.9% reliability as per Kempton is to accept 8.8 hours of annual outage, a 600% increase in downtime and a severe decrease in reliability from the status quo. Any action that moves the grid in this direction and with such magnitude should be rejected on its face even before consideration of cost. But let’s proceed onward to cost anyway. To get that 99.9% reliability required generating 290% of need — so nearly 2/3 of the power generated was curtailed. But to get to 290% generation at the national average of 31% capacity factor for wind would require 935% nameplate capacity. For solar at 19% capacity factor it would require 1,500% nameplate capacity. So, to minimize the need for storage requires building 9 to 15 times the capacity of power actually needed, and in addition to all that CAPEX we must add the 9-27 hours of storage that the study says was also still needed. And all this just gets us to a 600% reduction from current grid reliability. Current solar and wind generators are not economically viable with curtailment because the PTC subsidy is paid based on production. These operators would rather sell power at a loss or even at a negative price and collect the PTC than have it curtailed and collect nothing. Wind and solar are dead men walking, animated only by subsidies and must-take mandates. If the wind PTC is truly allowed to expire and is not retro-actively resuscitated again, all investor interest immediately crashes to zero. Even with subsidies and beneficial mandates as they have been for the past several years, wind cannot stand on its own feet economically. There is already not enough money in it even with the subsidies to meet VOM costs and maintain the systems. According to EIA generation data and industry-reported capacity factors, 4,700 of the 47,508 wind turbines on active wind farms built since 2000 are already inoperative — nearly 10% of the fleet. This performance is not tracking with the promise of 30-yr lifespans (another Kempton study assumption). Imagine the VOM costs of keeping 935% of needed capacity operational just to curtail 2/3 of that production. I would agree that if you can only get up to 99.9% of demand hours with overbuilt capacity is unacceptable in the U.S. for both reliability and economic reasons. 1. A model that estimates generation mix from economic dispatch but does NOT include reliability constraints is quite different than when reliability constraints are specified. This means modeling to the bus level. Regulation service is provided by primarily natural gas plants that can start/stop/ramp within minutes (on the same timescales as changes in demand and wind/solar output). My point here is not to debate whether we should be using solar or wind or other renewables (although obviously there are strong opinions on both sides here) but to point out that doing so requires balancing those loads somehow. Natural gas generation because of the inherent flexibility of the technology (as opposed to slow-ramping Rankine cycle plants) is well suited to provide this regulation service. To complement your Italian wind data variability graph, here is one for California that shows that even geographically dispersed intermittent resources do not deliver stable or reliable power production. And here is an example of a 5-MW solar farm that illustrates the difference between smoothed 1-hr data and high-resolution data that reveals the actual variability. I would like to elaborate on your comment that seemed to denigrate Rankine cycle power plants. Simple open Brayton cycle natural gas combustion turbines are certainly the lowest CAPEX option for rapid ramp rate power necessary to buffer intermittent solar and wind on the grid. However, adding the Rankine cycle (steam) to the Brayton cycle (gas turbine) greatly increases the efficiency of natural gas power and thus reduces the consumption of fossil fuels per unit of energy delivered — but the tradeoff is a reduction in ramp rate and much higher CAPEX. It is all these factors together that drive the effective GHG emissions of wind and solar to be higher per unit of energy delivered than efficiently powering the grid without wind and solar. Specifically, it is the combination of the additional thermal generation that has to be built and operated for regulation, reserve and backup; the proliferation of CTs instead of CCGTs, and the rapid ramping of these thermal generators keeping them ever outside their optimal performance envelope; that together conspire to increase the overall heat rate of the grid and thus its carbon footprint. The embedded GHGs and other emissions of manufacturing the unnecessary and duplicative capacity of solar and wind and transmission lines further pushes the net returns in both cash and climate into the red. Ike, great graphs that add well to this discussion. I definitely wasn’t denigrating Rankine cycle. As you note, the addition of a heat recovery steam generator and steam turbine to a gas turbine power plant can utilize the exhaust heat and improve efficiency. Modern CCGTs are pushing 60 percent efficiency (at full load). Simple cycle GTs are often used as peakers because even though their CAPEX is low compared to CCGTs, their VOM is high. CCGTs with their low marginal costs are increasingly being cycled to follow wind and solar loads which adds to maintenance costs and degrades efficiency. And as you note, the steam cycle affects ramp rate although GT OEMs have developed technologies to improve ramp rate. Even in combined cycle, most GTs can ramp at about 35-50 MW/minute. I’ll point out other natural gas technologies are better suited to cycle without maintenance implications – reciprocating engines have efficiencies of 50% (compared to about 35% efficiency for simple cycle GTs) and can ramp even faster than GTs. I have read the article … and there are also a lot of other opinions out there …. Solar power is cheaper in many parts of Asia than electricity from liquefied natural gas, meaning photovoltaics don’t need subsidies to compete with fossil fuels. Citi Group says solar is already becoming more attractive than gas-fired peaking plants, both from a cost perspective and a fuel diversity perspective. And in baseload generation, wind, biomass, geothermal, and hydro are becoming more economically attractive than baseload gas. Then there is the MN judge who sent the utility back to the drawing boards saying that solar provided a cheaper solution to the peaking issue and would be cheaper than a new gas plant. Jane, there is a whole range of time between when peaking plants come online (in the U.S. typically served by simple cycle gas turbines with efficiency in the 30-35% range when prices are high) and when baseload plants operate. See my comment above regarding regulation service. Load following plants are becoming increasingly important as we have more and more renewables on the grid. Aging coal plants that were once baseload are now operating in the shoulder months, highly efficient combined cycle plants (upwards to 60% efficient) are being asked to cycle daily to accommodate wind and solar loads. This is not the most economical or efficient use of these resources. Yes, hydro, geothermal and biomass can be (and do serves as) baseload, but just due to unreliable nature of it, wind will never be baseload. It is important to understand the differences, the technical limitations and how ISOs/RTOs maintain reliability to come up with workable solutions. History begs to disagree. Oil did not supersede coal as the leading US primary energy source till 1950 — after the massive industrialization of the nation and after WWII. The US economy transitioned from industry-heavy to services-heavy in 1945, and the energy-intensity of the economy has been falling since this point, so the heavy lifting had already been done by 1950. Oil’s niche is transportation fuel, not power generation or industrial energy or residential energy. The same attributes that made coal the vehicle for the rapid development of our nation and Western Europe continue to make it the vehicle of choice for the developing world that dwarfs the joules being contributed to that effort by all other sources, and which continues to grow faster in absolute terms than all other sources. Global coal production is up and exports are booming. This in an inexorable world-wide phenomenon that no Kyoto Protocols or EPA restrictions are going to restrain. I’m not cheerleading, merely observing the facts. In terms of dollar cost to the US consumers, oil products expense is north of $750 billion a year while coal is only $35 billion. So yes, cheap coal. However, in terms of our energy policy the issue really is the end of cheap oil. The end of cheap oil happened in 1919, 1934, 1979, and 2008. And in between were bathtub curves of enduring low oil prices. Oil prices peaked far higher in 1859 than in 2008 ($40/bbl in 1859 dollars v. $140/bbl in 2008 dollars). Rather than buying into simplistic narratives of irreversible secular forces and monotonically-increasing oil prices, it is essential to build a historical perspective and an understanding of the underlying forces behind cycles of perceived scarcity and glut that drive lagging cycles of price shocks and collapses that drive lagging cycles of capital investment/wildcatting and pullback/consolidation. In short, I believe your premise is flawed. See https://www.ourenergypolicy.org/metrics-for-comparing-alternative-liquid-fuels/#comment-1879 and my other comments in that discussion. I do not understand much of this discussion, because, although I understand the major sources of electrical power in the USA are Coal, Natural gas, and Nuclear energy, I have not seen a graphical distribution of electrical power use including other commercial energy use in the USA. For instance, an oil refinery produces and uses natural gas, but not solely to generate electrical power to supply an electrical grid. A refinery also supplies gasoline, which does not enter the electrical grid. One might suspect that if the natural gas price range deviation went from $14/MMBTU to $3/MMBTU in the last 5 years, that some accounting of this should equate financially to the future pricing basis of electrical source commodities, to justify capital projects and Maintenance/ Operational costs of existing facilities, etc. There is also the question of subsidies to enhance new forms of power, e.g., solar, wind, and ethanol. How do these issues fit together? Dawn & Ike … My comment was a response to the article Dawn suggested we read was meant to refute the conclusion that renewables, wind in particular, were dead without subsidies. The list was supposed to represent other conclusions about the viability of renewables and the wonders of gas and it’s relatively low price. Also, don’t take my word for the fact that you can over produce renewables over a broad area and still be economically fine as well as provide reliable supply. The economic case is made. Ike has called it ‘“arbitrarily” quantifying external costs. but for those health and environmental costs …. Dr. Kempton did not use subsidies in his calculation … he has used prior studies, Harvard for coal … which averaged $.09-27 per KW/hr … combined with other studies for other fuels and came up with a $17.45 as the addition. I don’t think that is ‘arbitrarily’ assigned cost and without some measure of the current externalities there is no real cost comparison. If some sort of quantification is not done … will you recommend removing all the tax benefits from fossil corporations? I have said that I am not an engineer but this study takes a fundamentally different point of view regarding the intermittency issue of wind and solar … “In order to manage variable generation, there are four known options: geographical expansion, diversifying resources (e.g. solar plus wind), storage, and fossil backup. All four are employed in this study.” I also pointed out earlier that very little fossil backup and storage is shown on the visual at figure 4. However, ‘Baseload’ becomes a different animal here and in Reinvesting Fire as well. It is not only the resource that matters but the structure of the grid that must change to accommodate a requirement for much less centralized generation and to ‘conduct’ the interacting parts. “Smart grids and advanced control systems will meet a larger share of the balancing responsibility”. It is a very different starting point with less demand and much more on-site production. Diversifying sources, can similarly level power production, as has been shown in prior studies of wind and solar. Reinventing Fire says, “well-diversified sites can reduce wind’s variability by up to ½”. For offshore wind, it has been shown that the Atlantic Wind Connection, joining the continental shelf wind farms from NY to VA and coming ashore at only several locations, is a major factor in producing more level power. Offshore is a different animal than onshore, blowing more consistently and stronger too. Jane, my issue with that type of study is it does not consider reliability constraints or outages. The 99.9% of hours would be unacceptable in the U.S. which has a much lower outage rate. Not including reliability constraints (thermal, voltage, frequency) means that this conceptualized system could be totally unable to actually the deliver the power. Having the capacity and output to meet demand (not hourly level, but real-time) does not mean you can pass that load over the wires. There are physical limits to transmission lines that even smart grid cannot overcome. If you have to build out new transmission infrastructure to make the system work, you add to the cost of the system. The U.S. electric transmission system was built based on centralized power generation and it will take time and investment to move to a distributed system. I would like to see a follow up that does transmission-constrained dispatch optimization as well as calculate land area for each of the renewable technologies to produce 290% of demand. Real time … The model used hourly meteorological data from 135 stations over 4 years. Don’t think it could be done real-time …. I am not sure what you mean by 99.9% of hours … The study says, “Of course, an electric system meeting our criterion of 99.9% from renewables and storage would not have lower reliability than today’s electric system, because we assume that a subset of existing fossil plants will be used to meet load when the new renewables and storage are not sufficient.” The storage load is visualized in figure 4. It is not large and the fossil backup is very small. The model as conceptualized does not move the excess over the transmission lines. It is designed to … fill some level of storage with excess generation and actually spill excess generation, not transmit. The model found that was the cost effective way of matching generation to load. I think it is quite interesting that the 99.9% actually has less spillover as shown on olive green than the 90% renewable choice. This is already a transmission constrained model. I really do think that this scenario is not out of the question. It shows us that de-fossilizing is most probably possible and not out of sight economically. We also all know that even getting to the 30% renewable, which is where the system must change, will take time and commitment. I just want us to move forward with as little pollution as possible …. And that really means no fossil electricity as soon as we can build out the renewable capacity, and reduce the growth in demand with building retrofits. Real-time: what I meant is that an hourly economic dispatch model (the study you cite) is an approximation. Grid operators have to balance fluctuating demand and loads by the minute (i.e. real time). I did not mean to imply the study should have been done in real-time, only to point out based on the output curves that Ike and I supplied, there is far more variation then when you look at hourly aggregated data. 99.9% of hours: Just to be clear for the record, current electric reliability reserve planning margins in the U.S. are based on an outage rate of 2.4 hours/year, equating to a reliability rate of 99.973%. Reserve margins are calculated for a region/subregion’s own specific load, generation, and transmission characteristics. You note that the authors did say they assumed that the remaining hours would use fossil fuels to meet demand. So even with an overbuilt system (reserve margins are typically about 15% compared to the study’s 290%), fossil plants are still needed for dispatchable power. The presumption here is that need would be met by natural gas plants, that can have quick ramping capability. The point about 250% of fuel input required for fossil units to generate 100% of load (i.e. assumes fossil plants are 40% efficient) actually underestimates the efficiency of newer power plants, particularly combined cycle gas turbines with a baseload efficiency of nearly 60%. Still, because of the overbuild required for a nearly all renewables system, I question the magnitude of land area needed to achieve this. That is not in the Appendix and would be an important consideration. The cited references refer to capacity and capacity factor of the various renewable types, not footprint. Less energy density/lower capacity factor sources = larger distribution/number of power sources. Transmission-constraints: it is not a transmission-constrained model. No where does the paper discuss modeling buses or contingencies. Modeling the load going across the wires gives you quite different model results than without these constraints. The authors have attempted to demonstrate it can work economically. They have not shown it can work from an engineering or reliability standpoint. So…back to the discussion of how best to match natural gas with renewables to capitalize on the advantages of each. Natural gas units are dispatchable and can provide frequency regulation and meet demand when renewables are not producing. Increasing the use of renewables allows the electric system to further decarbonize. Using subsidies to make renewables more competitive economically (essentially bumping them to the top of the merit order) introduces other issues including needing more grid regulation capacity and curtailing otherwise highly efficient generators (which by the way decreases efficiency and increases emissions somewhat). What if flexibility, zero carbon emissions and efficiency were valued more directly in merit order, rather than just marginal cost? Just a thought…. Your April 10, posting, and the illustrations hit the nail squarely on the head. Forcing the use of wind and solar will diminish the reliability of electrical energy, or it will actually increase overall carbon emissions. We are dealing with a very complex subject here, and very few of us are willing to let the facts speak for themselves, because the facts refute the pre conceived notion that renewables can be effective. I have been paying attention all my life, and I know there is no free lunch. No magic wand that will remove carbon from the real world of reliable energy. The only alternative is nuclear, but no one believes that. Natural gas is the only current politically and economically available option, if we seek RELIABLE electrical energy. A seriously unreliable grid, will lead to poverty for the poor. Dawn, thanks for asking an interesting question. Very lively discussion. I’m going to rephrase the question to look at a possible answer in a different way. First, some context. One of the aspects of your question is the transitional aspect of decarbonizing the energy system as a whole, i.e., for electricity, thermal(natural gas, fuel oil), transportation primarily. That is, our energy system is heavily dependent upon fossil fuels today. The meta-issue we’re dealing with in this discussion is how to decarbonize that system or minimize hydrocarbon energy sources. Decarbonization of our current energy system, since it is primarily being done to mitigate the effects of fossil CO2 on the atmosphere, also has to be done within a certain time period in order to “prevent dangerous human interference in the climate.” This time period is widely agreed to be by mid-century. That is, human-caused emissions of fossil carbon, along with deforestation, have to be reduced to close to zero, globally, by mid-century in order to stabilize atmospheric CO2 at a level that will not be dangerous to humans and ecosystems. Although there has been some debate in this thread regarding the need to decarbonize our energy system, that is the policy starting point for me. At least an 80% reduction in emissions from 1990 levels globally by mid-century is broadly accepted in the scientific community as being the minimum level of reduction to keep the global average temperature increase below 2-3 degrees celsius. It is also widely accepted that keeping the atmospheric carbon concentration below 450 ppm can avoid the worst effects of global warming for the majority of the world’s population. The second policy issue we’re dealing with in this discussion is an economic/resiliency one, i.e., accomplishing this transition while a) maintaining or improving reliability and resiliency for all energy consumers; b) maintaining rate and price stability, i.e., minimizing the cost to consumers. So the cost of mitigation has to be weighed against the cost of delay, i.e., the cost of adaptation. Again, it is widely agreed that the cost of mitigation (i.e., dealing with the cause of global warming) is dwarfed by the cost of adaptation (what will be required to deal with the effects of global warming if the causes are unchecked). The simple answer here is 1) reduce peak demand by aggressive deployment of automated demand response systems; 2) reduce average demand by improving efficiency, both in the existing built environment and in new systems; 3) deploy non-carbon emitting energy resources (distributed generation, storage, demand response with automated controls) as cost-effectively as possible; 4) deploy high quality, resilient (multi-fuel) fossil resources such as CHP and CCGT as required; 5) phase out, repurpose or retrofit existing fossil plants either as carbon capture and sequestration technology becomes cost effective, or as biofuel production becomes more cost effective and less energy intensive. The point of all this is to avoid building new fossil plants. Period. Because, eventually, they will have to be expensively dealt with as described above. Rational, planned deployment of distributed energy resources along with new automation technology, can and will help avoid building new fossil plants. Portfolios of renewables such as rooftop solar and small scale biomass-waste thermal technologies, along with storage, electric vehicles and demand response can use automated control systems to reduce their footprint and cost. Building on high penetrations of distributed, distribution-connected CHP generation along with high levels of distribution automation, advanced local weather and solar forecasting and thermal storage and distribution can reduce costs of moving toward low/no carbon building HVAC and domestic hot water. As these investments in distribution-level technology move forward, ISO markets being able to dispatch demand response resources, as is happening today in CAISO/CPUC with supply-side DR, will help relieve the need for new flexible fossil resources. EV charge and discharge can be integrated into grid operations to deal with overgeneration conditions. Finally, fully utilizing AMI technology to expand and improve broad portfolio of demand response resources, through direct load control, programmable communicating thermostats and real time pricing, will further reduce the need for new flexible resources. All things considered, it would probably be better to pay the cost now of investing in these technologies out of the gate, rather than paying the cost later of retiring or retrofitting any fossil plants that might be built now. However, if new flexible capacity is required during this transformation, then the full lifecycle cost of that resource should be evaluated, including the carbon cost, and the cost of retirement, retrofit or repurposing. Dave, very good comments. I agree with your thoughts in terms of reframing the discussion to look at least cost solutions to decarbonize the energy system. I think most of the comments here have pertained to electricity production – if we start to discuss transportation fuels, that leads to many more considerations and issues so I will restrict my comments to electricity markets. I agree that there is not a one component solution, that DR and AMI will fill very important roles. Solutions are highly dependent on the existing generating fleet in a state/region and transmission infrastructure. I would like to focus on efficiency a bit. There are a lot of fossil generating resources that are currently not used optimally – at highest efficiency and lowest emissions/MWh. Improving the overall efficiency of the electrical system (and energy use) reduces the amount of capacity that must be built. Some analyses I have seen of regional systems (and CAISO in particular – study by DNV KEMA I believe) showed impressive emissions and cost benefits of system optimization (based on flexible generating resources, demand response and large portfolio of renewables). CAISO has developed a flexible ramping constraint for market optimizations – can you speak to that product and how it has helped value resources that can quickly adjust load in the five minute market? Also, with the SONGS retirement and CPUC decision to include natural gas in the procurement decision, was this to address concerns about load balancing? Dawn, Yes the discussion was raised as a question of synergies. My point is that very little ‘synergy’ is needed if we can almost fill the bill for electricity generation with close to 100% renewables. An emphasis issue? I am talking about gas for grid electricity. And yes you are very clear about your statements. I understand the idea of fluctuating demand and the fact that gas is easily ‘dispatchable’ compared to nuclear and coal. That is how most of us, me included, came to the idea that gas would make a great transition fuel. Certainly the choice was fine before the methane calculation and leakage issues surfaced, and before the now evident fracking well issues were general knowledge. However, if we can take the current system to almost 100% renewable why the flurry of building permits for natural gas fired plants? Demand is flat at the moment and we can handle 30% renewable with no major system change. Investment monies belong in renewables today. Evidently I am the one who is not clear. Language is funny … I read Output reliability and system reliability in a different way – as two different things. The study says that the only reliability they modeled for was the reliability of their input sources. In their words, they did not model for reliability issues that are not related to “renewable resource fluctuations”. The whole idea here is to challenge “The common view is that a high fraction of renewable power generation would be costly, and would either often leave us in the dark or would require massive electrical storage.” I think they have done is worth moving forward with today. The diagrams you and Ike posted are different animals from what this study does. 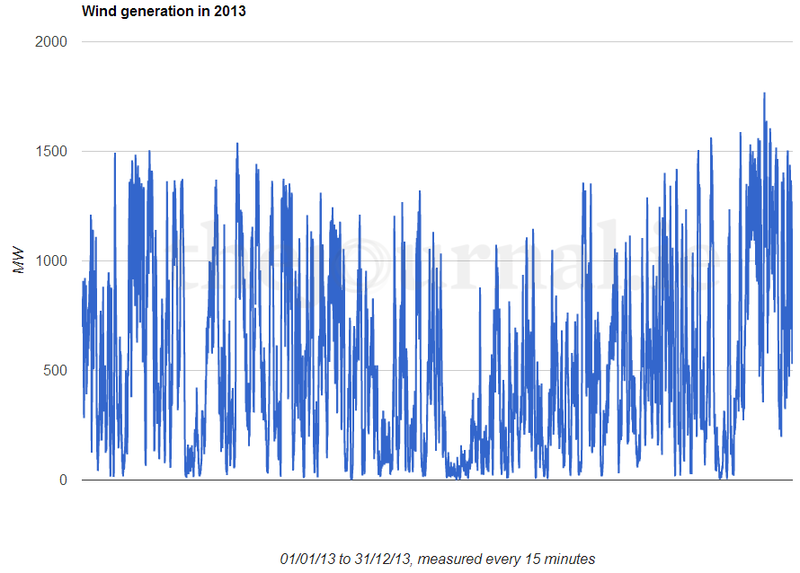 Certainly a single, or even several renewable generators at one site produce intermittent power. The model’s need figures were taken from across the entire PJM area and satisfied by renewable output. None of the figures were pulled from thin air. Please see the National Academy of Science presentation and its backup paper. “World wind power resources are abundant, but their utilization could be limited because wind fluctuates rather than providing steady power. We hypothesize that wind power output could be stabilized if wind generators were located in a meteorologically designed configuration and electrically connected. Based on 5 yr of wind data from 11 meteorological stations, distributed over a 2,500 km extent along the U.S. East Coast, power output for each hour at each site is calculated. Each individual wind power generation site exhibits the expected power ups and downs. But when we simulate a power line connecting them, called here the Atlantic Transmission Grid, the output from the entire set of generators rarely reaches either low or full power, and power changes slowly. Notably, during the 5-yr study period, the amount of power shifted up and down but never stopped. Dominion missed this entire point when they submitted leas bids that would NOT require them to hook into the AWC. Looked like an excuse to maintain the ‘intermittency’/unreliability’ issue and build more gas-fired plants..
Subsidies … This paper does not use subsidies. My problem with comparative costs remains the same. The authors have included a figure to represent the externalities excluded from the prices of fossil resourced electricity. I think Minnesota is doing a great job with their substitute for net-metering using a variation of Austin, TX’s ‘Value of Solar.’ PJM will change the price clearing mechanisms and have stated that the ‘capacity’ calcs were defined for an old system. “Efficiency” too is a different animal if it means the output of one stationary plant. That is irrelevant as RMI says. Footprint … The paper extrapolates from a paper that models PV rooftop possibilities for Newark, DE. The footprint is not relevant for rooftop as they use NREL’s GIF based Solar calculator and their “technical Potential” for each state. Shady roofs don’t count. Interestingly in VA, NREL says we could ‘technically’ produce 16-17 times the amount of electricity the whole state uses in rural PVsolar. Their charts include your ‘footprint’ data …. and that does not include any rooftop PV! VA has a surfit of resources! Flexibility is where we are going, I agree. But like Reinventing Fire, ACEEE and others, I would like to see us stop investing in long-term fossils while we have this extra capacity that will last a few years. Let’s put our investment monies into efficient buildings and local PV. We could cut our central grid requirements by 80%! Really! AND … I do like Buckminster Fuller’s line quoted in Reinventing Fire … “To change something, build a new model that makes the existing model obsolete”. Maybe seeing this differently is just my ‘beginners eyes’. Interestingly there are places that are doing quite well already! Jane – thanks for posting the article. There are a couple of points I would make on the article, which merit consideration. One is that the examples of high renewables in Spain (49%) and Portugal (70%) necessarily depended on hydropower to achieve those levels. Without hydro Spain was at 29% and Portugal at 30% renewables. There was recently an interesting post related to penetration of renewables. The point made was that penetration of renewables was effectively constrained below the point where their energy share equals their capacity factor and that higher penetration required energy storage (or sinks, curtailment). In the case of Spain and Portugal, that is served by pumped storage hydroelectric. Spain has significant pumped storage capacity of over 5,350 MW. They also have a significant number of pumped storage projects under development. This is a good seque to another discussion on this site related to whether U.S. should invest to update aging hydropower infrastructure in the country. It is an interesting discussion. The study also identified a need to curtail solar, wind and hydro loads a primary challenge, because curtailment introduces uncertainty in electricity sales and negatively impacts power plant economics. As a result, NREL concluded that additional transmission corridors would be needed to alleviate transmission congestion. The bottom line of the report is that a more flexible system was needed to accommodate increasing levels of renewable generation. My point is that achieving high levels of renewables will require flexible, dispatchable resources. That can be served by natural gas and pumped storage. And thus we are back to discussing synergies rather than either-or choices. I would hope that use of natural gas for utilities is not frustrated by ideological differences. It is better for the environment and will generate ( excuse the pun) much less ghg. It is also quite amendable to coordinated use with wind and solar energy. I would add that similar benefits re. environment and likely costs would accure if we used natural gas based ethanol and methanol for vehicles. I do hope that while we extend the use of natural gas and its derivatives, we also push for renewables to make it to prime time…..re. cost, efficiency and consumer needs……We should view natural gas as an alternative transitional fuel and join not fight renewal fuel advocates in developing a comprehensive energy and fuel policy.